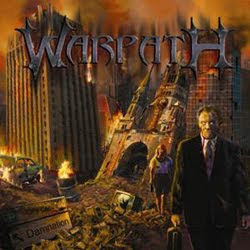 Review: Warpath is one of the many bands to enter the newest wave of thrash metal. These guys take on a more traditional thrash sound instead of a more extreme thrash sound like some bands like Skeleton Witch are doing. This bands sound is very much like older Slayer in ways but they do add their own feel to the music. These guys also remind me alot of their fellow UK thrash band Evile. Like the other bands listed these guys offer up an album filled with plenty of killer shreds with traditional in your face vocals and a great sense of rhythm on such tracks as "Spitting Blood" which is a mid-paced track that reminds me of a tank ride into battle. Now that track is a rare moment on this album because for the most part the rest is a full on thrash metal assault. Overall this is a badass album from a band that is surprisingly unsigned, but of course Warpath was unsigned when I reviewed them and now they are signed so it's only a matter of time for this band! Highly recommended to any fan of thrash and the new wave of thrash!